I'm having a little problem in SvR 2011. I'm having a problem about how to walk. I can't walk in a backstage of Road To Wrestlemania storyline. I can't walk in a match too unless I change the control in Type-B. I'm using a USB Controller and all it's button are working fine. I don't know what's the problem. Please, Help me! Are you using the analog stick for walking? 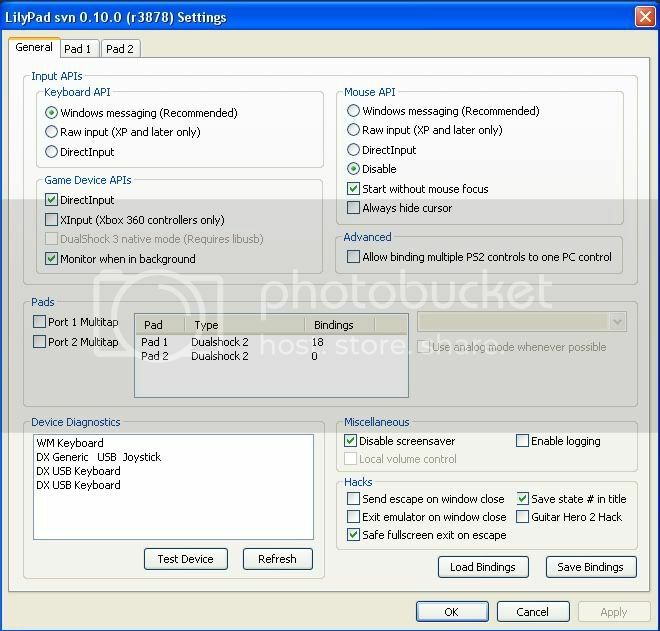 Please post a screenshot of your Lilypad plugin settings (both general and pad 1). (01-29-2011, 03:07 PM)Shadow Lady Wrote: Are you using the analog stick for walking? You don't have either of the Analog sticks configured, you should have both of them set for your games. (01-29-2011, 07:49 PM)Shadow Lady Wrote: You don't have either of the Analog sticks configured, you should have both of them set for your games. 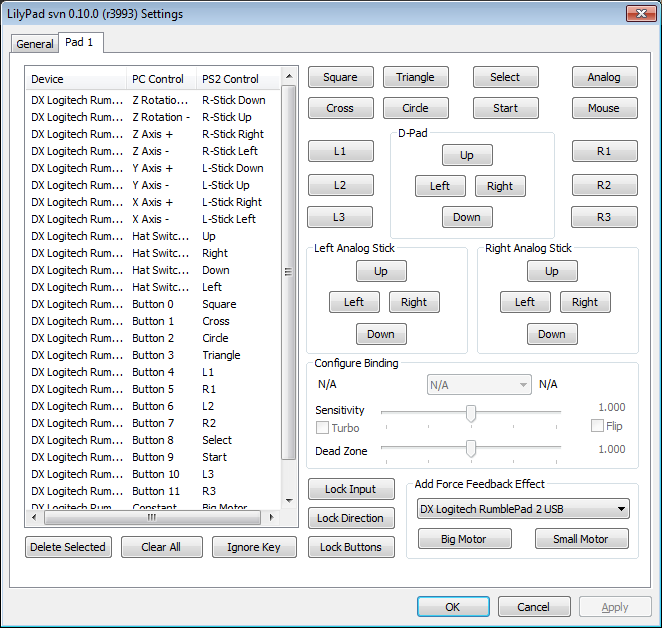 Uh.... click on the directions buttons (up,left,down,right) for both the "Left Analog Stick" and "Right Analog Stick" in the Pad1 tab and set them to your gamepad. Both Analog sticks and the digital pad (D-pad) must be configured and running like they would in the PS2. I'm a little bit confuse. Both Analog and D-Pad are working in the game. So it means the analog is already set because like I said it's working. Your pad configuration says only the d-pad has been configured so far. The first 8 are for Left/Right analog sticks, the next 4 are for the D-pad, the rest are the PS2 buttons. Sometimes when the analog sticks are not configured the gamepad will use analog sticks as a d-pad (depending on drivers and the gamepad) and that's probably what you mean by they working, so just make sure you configure the analog sticks first (so far they aren't according from your screenshot). (01-29-2011, 09:51 PM)Shadow Lady Wrote: Your pad configuration says only the d-pad has been configured so far. WOW! It works! Thanks you very much! I appreciate your help. Thanks again.